Frankfurt-Niederrad is the near city district, which is developing from an office district to an urban living area, a modern combination of life, living and work. In the Blue Towers, more than 350 bright and modern apartments for personal use are being built across 13 storeys in the towers and 6 storeys in an additional apartment block. The ground floor has space for shops, a gym, restaurants and offices. An all-round service including concierge services, facility management and additional services for personal use are available on request. These are mainly 1 and 2-roomed apartments, which are available as either fully or partially furnished housing. The ground floor will accommodate restaurants and shops. The two-storey underground car park offers more than 400 parking lots. Completion is scheduled for mid 2019. The development of a residential park with 10 residential units and a living area of around 1,082 m² is planned in Oldenburg (about 45 km west of Bremen). The Grounds purchased the property with a total plot size of 1,617 m² in 2017. All the conditions for the start of construction and erection of convenient owner-occupied apartments are met. Preparations for the awarding of the construction contracts are currently unerway. The property is already gaining a positive market response. This project is not intended for The Grounds Group portfolio, an exit is possible per individual sales of the residential units in 2018 and/or upon authorisation of the building permit. At the end of September 2017, The Grounds Group purchased a plot with an area of 5,683 m² in the Gutleutviertel in Frankfurt am Main, in a central location close to the Main Station. The Grounds Group plans to develop a four-storey micro apartment facility (Boarding House) inclusive of an underground car park, restaurants, conference rooms and a gym. The Grounds submitted the building permit application, building permit is expected for October 2018. A reputable international estate agent has been commissioned to market the property. The commencement of construction is expected in 2019. It is intended to market the majority of these micro apartments individually for commercial use prior to the start of construction. The Grounds Group plans erecting a commercially used micro apartment facility with approx. 225 apartments with an adjacent underground car park on the 8,400 m² plot at Terminal 3 (Neu-Isenburg) of Frankfurt airport, which is still under construction, it was purchased at the beginning of October 2017. Fine tuning work on the building permit application with the relevant authorities is currently ongoing. The Grounds plans to submit the building permit application in good time. Commencement of construction is intended at the beginning of 2020, corresponding with this, completion is scheduled for the simultaneous launch of operations of Terminal 3. In Schwarzheide (about 110 km south of Berlin) The Grounds Group plans developing residential properties on a building ground of around 40,000 m². Detailed project information has not yet been finalised, the construction concept still has to be coordinated with the municipality. The approval for construction plan is expected for 2019. Development measures and construction could start as of 2019; completion of the residential property would then be possible around 2021. In Mid-February 2018 The Grounds Group purchased a land in a central location in Halberstädter Strasse, Magdeburg. This will be used as a further project development for micro-apartments and furnished accommodation. Apartments with a total living area of approx. 4,000 m² are planned, together with 30 underground car parking spaces. The investment volume for the land and building is around EUR 10.50 million. The right to build exists for the property, and corresponding building applications were filed in June 2018. The commencement of construction is expected for October 2018 with planned start of construction at March 2019. The property is suitable for both sale and subsequent portfolio holding by The Grounds Development AG. Magdeburg, the capital city of the State of Sachsen-Anhalt, has shown a positive development in population numbers since 2012, and is an aspiring growth city. At the beginning of March 2018 The Gounds Group purchased a property covering 1,317 m² in a central location of Leipzig for the construction of a micro-apartments student accommodation building. This is located at a city location of Leipzig in the immediate vicinity of the Universities of Applied Sciences and Telecommunications. Approximately 136 micro-apartments with a total living/usable area of 3,013 m² and an investment volume of approx. EUR 11 million will come into existence here. Entitlement to build exists, preparations for building have already started in the second half of 2018. This project is being implemented as a joint venture with a well-known Leipzig property developer. Grounds expects to complete the furnished micro-apartments building in 2020. In October 2018 The Grounds has successfully disposed of the project for EUR 13.35 million in a forward deal. The purchaser is a German institutional investor that has acquired the project for one of its funds. Leipzig, which is still Saxony’s most populous city ahead of Dresden, the state capital, has distinguished itself for nearly 20 years by a positive development in its number of inhabitants, with a steadily growing proportion of students. Approx. 15,000 students are currently studying at the two universities located close to the project alone. Leipzig’s economic development in the past few years has also been strong, and the mood regarding the economic situation is now better than ever before. In Mid-April 2018 The Grounds Group won, with a coherent, harmonious concept, Heubach municipal council’s approval to redevelop an urban district on the old Triumph site in Heubach, part of Stuttgart’s metropolitan region. Apartments, a care home and sheltered housing facilities, supplemented with opportunities for shopping and recreation, will be created on a 10,652 m2 area of land in this structurally strong region with great economic power. The urban district entirely follows the guiding principle of living in harmony with nature – for all generations! For example, it will include an integral combined heat and power station and solar energy, together with buildings planned according to the latest KfW (Reconstruction Loan Corporation) Energy-Efficient Building Standard. The total ­investment volume for this project development is approx. EUR 25 million. A care home for 60 residents will be constructed between Böbinger Str. and Mögglinger Str. Roads, together with an additional building with 40 small apartments for sheltered housing. There is also provision for modern living accommodation on attractive terms in six terrace houses and other buildings with 32 apartments. The overall development also focused on integrating shopping facilities that will be augmented by the existing Lidl supermarket. The municipality has announced that it will decide on the development plan in September 2018, so a prompt start can be made on building permit applications, and construction is scheduled to start as early as 2019. In Mid-May 2018 The Grounds Group has signed a purchase contract for a site in the “Alte Neustadt” district in Magdeburg city centre. In consultation with Magdeburg’s City Council, an urban district for all generations will be constructed on a total area of around 38,200 m2 on the inner-city site of the former Börde brewery. Plans include the development of an extended stay apartment block, several multi-family houses with rented and owner-occupied apartments together with sheltered accommodation and the construction of a child day-care centre, as well as 600 car-parking spaces. A total of 750 residential units with a usable area of 40,000 to 45,000 m2 will be built, of which 120 units are accounted for by the extended stay apartment block and 180 by sheltered housing. The intention is for the development plan to be coordinated and adopted by Magdeburg City Council by the end of the current year. This project development is not intended for our own portfolio, and a sale (either entirely or in blocks) can then take place after adoption of the building development plan from 2019 onwards. Including the purchase price, The Grounds expects investment costs of approx. EUR 10 million by the time the building development plant is adopted. At the end of July 2018 The Grounds Group purchased six plots of building land with a total area of 160,900 m² in Bad Zwischenahn health resort (around 17 km west of Oldenburg). In consultation with the city council, a holiday/recreation area is to be constructed on the protected landscape area directly alongside Lake Zwischenahn. The plan is to erect multi-storey residential buildings (approx. 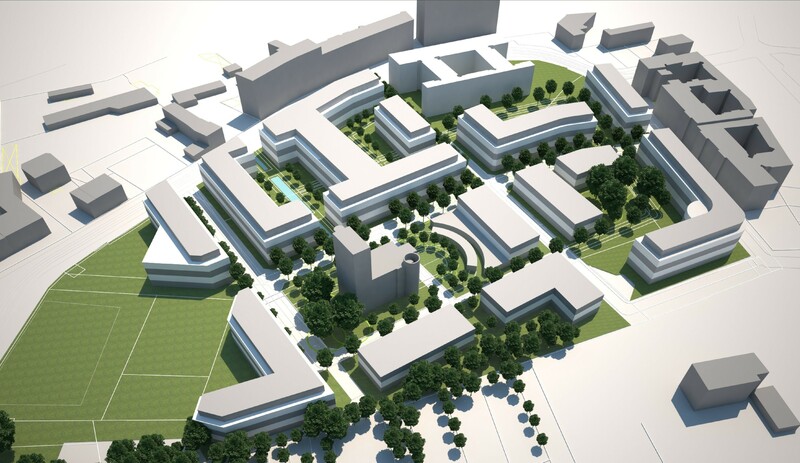 20,000 m² of living area) including parking bays and underground car parks and a 4- to 5-star hotel with approx. 120 suites and rooms, together with 35 holiday homes (living area approx. 2,500 m²) along with sports and leisure areas. In addition, The Grounds has also acquired the former officers’ mess (a listed building) directly alongside Lake Zwischenahn, including the associated seminar areas. These buildings will be retained and a housing development constructed inside them. The characteristic aspects of Bad Zwischenahn, the largest municipality in the Ammerland rural district of Lower Saxony and a state-recognised health resort also called the “Pearl of Ammerland”, are tourism and healthcare. The main attraction is Lake Zwischenahn with its water-sports facilities and network of cycling and walking trails around the lake. The plots of land acquired are located in the Elmendorfer Road area in the Rostrup district of the town northwest of the town centre, on the part of the previous airfield site formerly used by the military. The buildings, partly listed, originate from here. Depending on the final adoption of the development plan, which is expected by mid-2019 at the latest, The Grounds currently expects a total investment volume of around EUR 92 million. In Ocotber 2018 The Grounds Group purchased a land measuring around 2,740 m² in a central location in Halberstädter Strasse 1, Magdeburg (not contiguous with areas already acquired), to develop an exclusive furnished micro-apartment block. This is intended to comprise 174 residential units on a planned rental area of around 5,070 m², with completion scheduled for 2020 to 2021. The investment volume for this project amounts to approx. EUR 16 million. Exit can take place both in a forward deal and in individual sales, since the demand for exclusive apartments in Magdeburg is growing strongly.